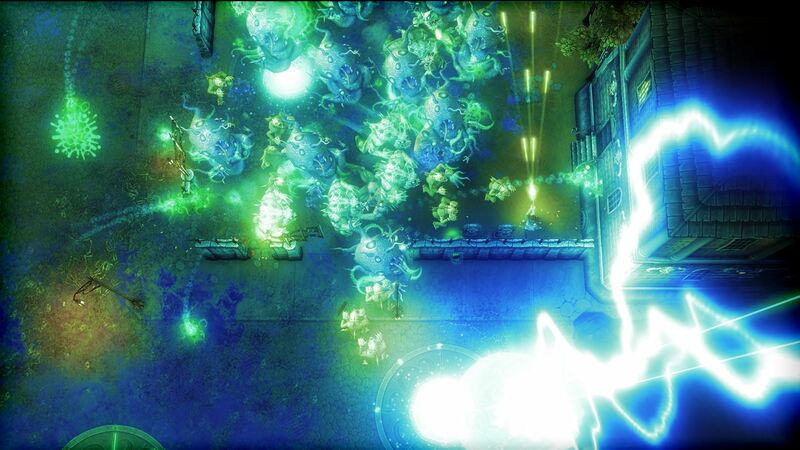 Tesla vs. Lovecraft will catch most folks’ attention just due to the theme, but the core twin stick shooter gameplay underneath is more than solid enough to stand on its own. In fact, the gameplay pretty much has to carry the experience because the hordes of Lovecraftian horrors you fight are disappointingly indistinguishable from any random mobs in any other game. The gameplay rocks, though, with a fun perk system and satisfying difficulty progression that makes it a blast to play through. Continue reading our full review of Tesla vs. Lovecraft for Xbox One for all of the details. Cons: Lovecraft presence is weak; curse you random upgrades! Tesla vs. Lovecraft begins with Nikola Tesla showing off his latest invention, which pisses H.P. Lovecraft off for some reason. Lovecraft then unleashes his hordes of monsters onto Tesla to stop him and Tesla fights them off with his electricity-focused inventions. That’s it. That’s the story. It sounds pretty awesome, right? Unfortunately, the Lovecraft part of the equation seems more like just a name drop than anything particularly noteworthy. The hordes of monsters you face all certainly have the proper Lovecraftian names, but when there are hundreds of them onscreen you can’t tell them apart from any generic enemies from literally any other game. I was kind of expecting actual Lovecraft-style mind breaking horror now and then, not just generic enemies with neat names. Even if the Lovecraft presence is a little disappointing, the gameplay in Tesla vs. Lovecraft is awesome. At first it seems like a typical twin stick shooter – move with the left stick, aim with right stick, pull right trigger to shoot – but a fantastic upgrade and perk system help make the experience much more interesting. Tesla also has a short range teleport so you can get out of danger as well as a mech suit (once you collect all of the pieces for it). 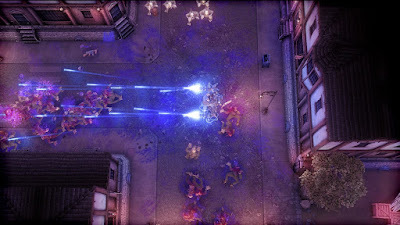 Weapons – common pistols and shotguns at first, but eventually you get cool stuff like gauss assault rifles and ball lightning guns – and special abilities – clouds of static electricity, Tesla poles that shock enemies that come close, explosive barrels, and much more – all randomly drop around the map as you play. 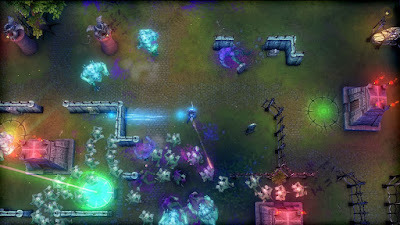 Each level in the game is a sort of arena where Tesla has to kill a specific number of enemies in order to move on. He starts at “Level 1” in each level, but as you kill enemies you earn XP that lets him level up and choose different upgrades and perks. The upgrades include things like faster reload times, more powerful weapon shots, faster teleport cooldown, more health, and things along those lines. You get to choose between two upgrades each time you level up. Because the upgrades that are offered to you, as well as the weapons and abilities and power-ups scattered around the maps, are random, however, success or failure in a particular mission can sometimes be up to RNGesus actually giving you the weapons and perks you want on a particular run. Even the final battle against Lovecraft has an RNG element to it, which can be frustrating as you wait for the required stuff to drop all the while fighting through hundreds of enemies. Even with the random elements, the game is still very, very fun. The gameplay is very precise and polished and feels good. As you play you also unlock permanent perks and upgrades and new weapons and upgrades will become available, so the game has a very satisfying feeling of progression as you play. There is a clever difficulty progression as well as first you have to beat levels in the normal world, then the Aether plane, and ultimately the Eldrich plane. Even though you play through the same levels, each plane ramps up in difficulty and chaos and enemy density to the point the Eldrich levels are just absolute insanity (which, I guess they should be, right?). All the while you’re also earning permanent perks and upgrades and getting stronger, too. It’s all very satisfying. In addition to playing the campaign levels (and there are a bunch), you can also play an endless survival mode as well. The survival mode is really, really addictive and I can see myself coming back to it for quite a while. I’d also like to add that the game has a fairly easy 1000/1000 Gamerscore to earn just by playing normally, so if you’re into that it’s worth a look. Presentation-wise, Tesla vs. Lovecraft is solid, but unspectacular. It runs smoothly and has lots of brightly colored special effects to contrast with the generally dire and dingy backgrounds you’re fighting in. The sound is similarly OK, though I do like the rock music that plays when you use Tesla’s mech. 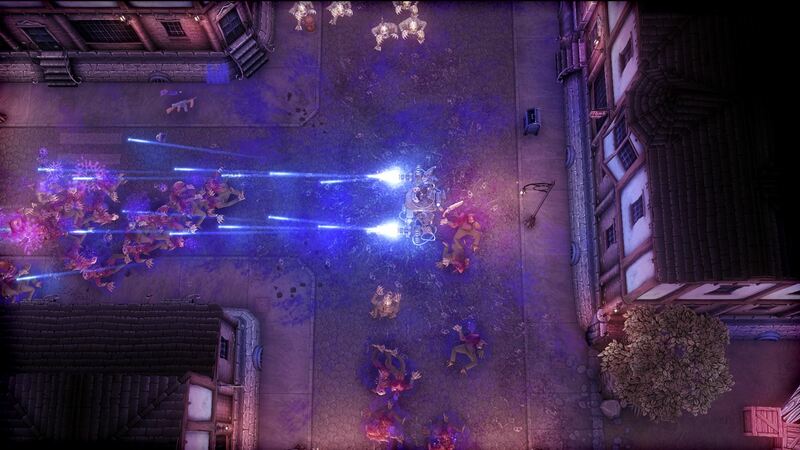 All in all, Tesla vs. Lovecraft is a very fun twin stick shooter that fans of the genre should definitely check out. The gameplay is fantastic and the perk system and overall feeling of progression is very satisfying. It has solid replay value, too. For $15, Tesla vs. Lovecraft is pretty easy to recommend for a purchase.